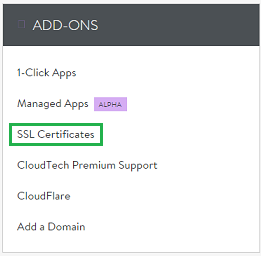 Once your certificate request has been approved and issued by third party certificate authority, you have to follow some manual actions to install an SSL certificate on Media Temple GRID server. However, the basic steps to configure SSL certificate on Media Temple GRID server are similar. Generate a certificate signing request. Submit the CSR to your certificate authority. Receive the certificate via email. Just download your certificate from your email that sent by certificate authority for your website. You can also download it from your SSL management dashboard. Unzip your certificate folder, which will contain your certificate files including CA Bundle. Log into Account Center at Media Temple. 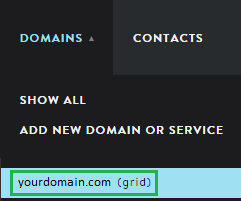 Look at navigation bar, click on “DOMAINS” and choose your desired domain name. Go to the “ADD-ONS” section and click on “SSL Certificates” option to secure your Primary Domain. If you want to secure your alternative domain, then go to “ALTERNATIVE DOMAIN ADMIN” section and click on “SSL Certificate“. Insert your Certificate Files and click on “SAVE“. Congratulations! You’ve successfully installed your SSL certificate. Now, browse your site with https:// to test your SSL and server configurations. You can verify the certificate details by clicking on padlock icon in the browser, if your site is working correctly on HTTPS version. You can use our online SSL installation checker to confirm your server’s configurations.